This Wooden Snowman was made by our son Andy! He is approximately 17” x 11”. 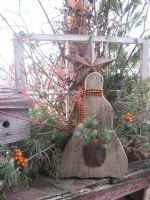 He is made of rough pine with a rusty tin pocket filled with artificial pine and berries. He has a homespun scarf tied around his neck and a saw tooth hanger on the back to hang him up if you like. This little guy will look adorable in your winter decorating. 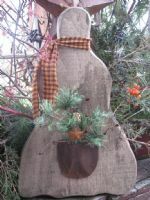 Place him in a display of greens on the front porch or hang him on your front door. The nice thing about snowmen is you can keep them up all winter season!! This Snowman will come without a face, but if you would like one put on, Just let me know in the comment secton of your order! No Problem!! $30.00. FREE SHIPPING IN 48 U.S. Others E-Mail me. I offer $$ off average U.S. Shipping cost.